Sure, there had been celebrity radio DJs like Alan Freed, but the idea of going out specifically to hear a DJ spin live really gained traction with the localized explosion of popularity of American soul in the North of England. The more obscure the platter, the better. In fact, many top DJs concealed the identity of their best records, in order to keep them out of the hands of the competition. John Clark and his mate hope to be the next big thing, but they will have some growing up to do first. The characters are fictional, but the music, venues, and amphetamines are true to life in Elaine Constantine’s Northern Soul (trailer here), which opens today in New York. Clark is your basic anti-social under-achiever, but when he hears his first Northern Soul record at the youth center, it hits him like a lightning bolt. John is the one who played it. He was given a limited tryout window, but most of the crowd is not as hip as Clark. At least a fast friendship is forged when Clark weighs into the ensuing melee on John’s behalf. Soon, the somewhat older emancipated youth is tutoring Clark in music and fashion. They become a DJ’ing duo and hatch a scheme to hunt down obscure soul gems in America. However, it eventually becomes apparent John is the big talker, whereas Clark is the doer. It is also clear the latter is a self-sabotager, who cannot hold his amphetamines as well as Clark. Consequently, inevitable tensions threaten to tear their partnership asunder. On the plus side, Clark might finally be getting somewhere with Angela, the pretty nurse he has long carried a torch for. Interestingly, the interracial nature of their halting relationship never seems to be an issue, which is all quite nice. However, the question of white appropriation of African American music is never addressed either, which is more problematic. Of course, we are expected to infer the white Northern Soul fans are drawn to the music because of their status as economic underdogs, much like Roddy Doyle’s Commitments. Clearly, Constantine profoundly digs the Northern Soul sound. She also gets credit for forthrightly depicting the rampant drug abuse corrupting the scene. There is a lot of grit and Fame-like resiliency permeating her film, but the narrative is not blindingly original. In fact, Northern Soul weirdly parallels Jason Lei Howdon’s Deathgasm, except for the whole demon apocalypse thing. Regardless, Elliot James Langridge certainly looks like a pasty-white, poorly socialized record collector. He also gets effectively bug-eyed and clammy as Clark’s speed intake increases. Frustratingly, the charismatic presence of Antonia Thomas is largely wasted in scenes where Angela coyly smiles at Clark from afar. Conversely, Josh Whitehouse is so convincingly annoying as John, you will want to hit him with a two-by-four, but that is what he is supposed to be going for. It is a strong ensemble, but fans should understand Steve Coogan is Northern Soul just enough to justify his name on the poster. Still, his casually contemptuous high school teacher is instrumental setting up Clark’s big teenage defiance scene. This should almost go without saying, but the soundtrack is awesome. Lou Pride’s “I’m Com’un Home in the Morn’un” is especially catchy as established DJ Ray Henderson’s secret “cover-up” song. If you like Northern Soul, Northern Soul delivers as promised. It just comes with some melodramatic excesses here and there. Overall, it is quite evocative of an era and a musical phenomenon. 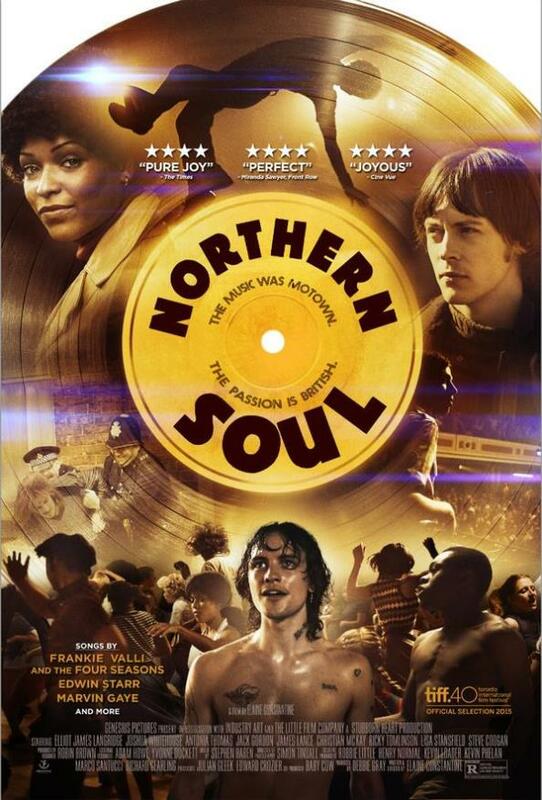 Recommended for all manner of Soul and R&B fans, Northern Soul opens today (10/2) in New York, at the AMC Empire.